Oh hey there! I'm so excited to be part of a pie party collab again with a bunch of my blogger/instagram friends. 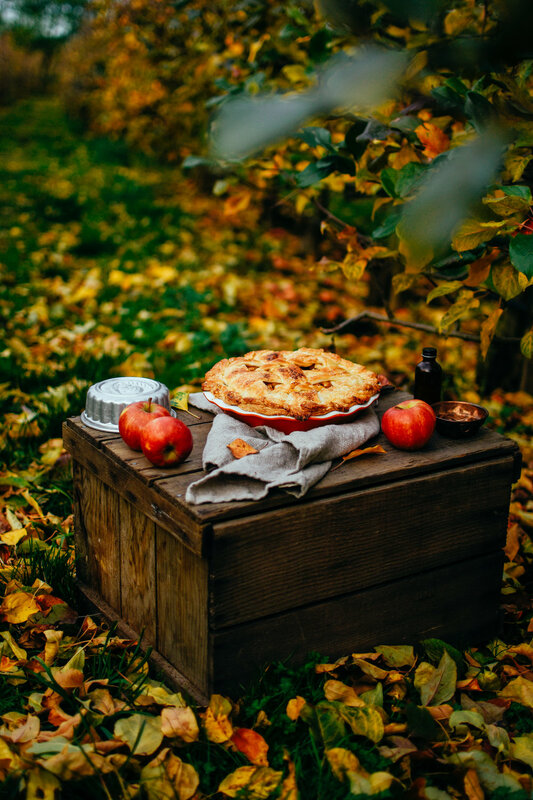 There are soooo many incredible pies being posted today....and I can't wait to try out some of their recipes myself! I just love connecting with like-minded foodies, and this bunch is gold. So much creativity and inspiration here. Also, I know my American friends have Thanksgiving coming up, which is perfect for pies! And everyone else...who really needs an excuse to make pie. Treat yo self. Today we're putting a small twist on a classic. Apple pie. 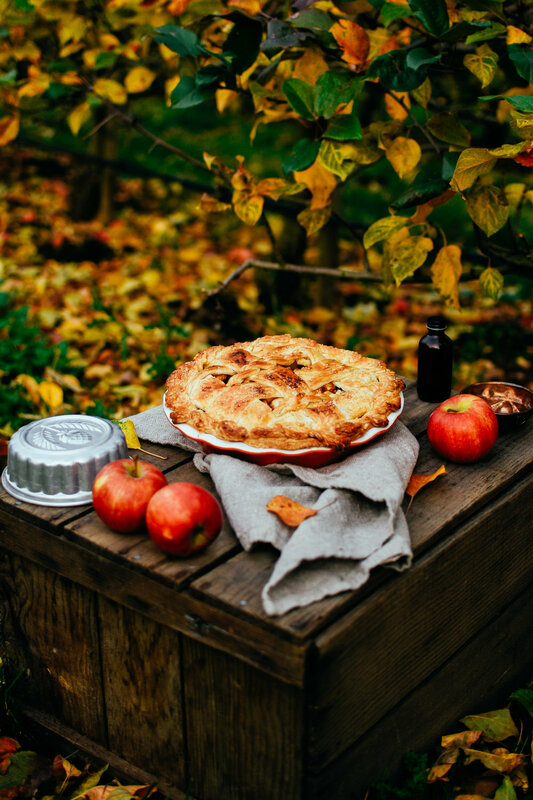 It's kind of the best Fall pie, especially for those of us lucky enough to live on an apple farm. I added some fresh grated ginger to spice things up a bit (hehe), and it was such a lovely, warm addition. Also, you might have noticed by now that I always share the same pastry recipe....and that's because I think it's pretty much perfection. I know you butter lovers seem convinced otherwise, and maybe one day I'll stray from this recipe, but it is seriously the best. I shot these photos in our orchard a few days ago (hello procrastinator. haha). The apples are all off the trees by now, but the leaves are starting to change colour, and it's pretty magical. Not gonna lie tho....dragging everything out to the farm and into the orchard is not as glamorous as it sounds! But I think it was worth it for these photos. 9) Divide into 3 or 4 equal parts. Each part will make one pie, so you can choose to use it all at once, store some of the dough in the fridge* for up to 2 weeks, or pop some of into the freezer for later! If you're using a deep pie dish, or want to do a lot of fancy crust stuff you'll want to use more dough. 1) Once your pie dough is ready, you can peel and chop apples (the exact number will depend on the size of your apples, and how full you want to make your pie). I used a standard dish and was happy with 6 apples - but with a deeper dish I might go with 8 apples and add a couple teaspoons more of flour and sugar! We used Elstar apples, which are nice and tart, and are wonderful for baking with. 3) Roll out a piece of dough for your bottom half of the pie, and drape over the pie dish. You want it to hang over the edge a bit, so that it's easy to crimp to the top. 4) Add your apple mixture to the pie plate and pop the whole thing in the fridge while you get the top ready. 5) For a simple top: roll out another circle of dough, and either slice a few slits in the top to let the steam out when baking, or use small cookie cutters to cut out decorative shapes. Dip your finger in water and run along the edge of the bottom crust before pressing the top crust into it, and crimp the edges together. 6) For the top in this recipe, I rolled out a large rectangle of dough, and proceeded to cut wide strips out with a pizza cutter for the lattice. I cut very skinny strips and braided them to add a bit of interest to the lattice. Finally, I cut out some leaves with small cookie cutters, and scored them with a paring knife to show the leaf veins. Whenever you join two pieces of dough, be sure to wet them a bit with water and press together firmly. 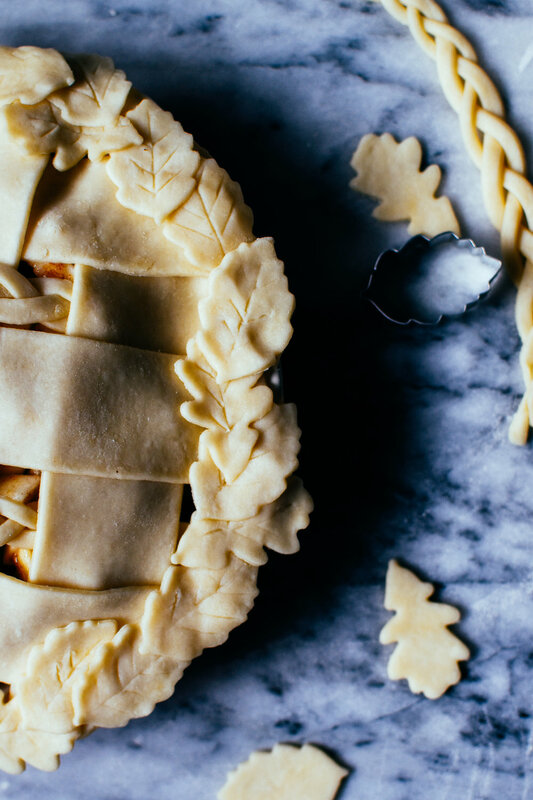 7) **Important: chill the entire assembled pie for at least 15 minutes in the fridge before baking. This helps ensure that your crust will be flaky! Especially if you've spent some time braiding/cutting out leaves and the dough has sat on the counter for a bit. 8) Optional: mix an egg with a fork and brush onto the top of your pie to help with browning and add some shine. (Can alternatively use milk). Sprinkle immediately with coarse sugar. 9) Bake at 425 degrees for the first 15 minutes, and then reduce heat to 350 degrees for 40-50 minutes until nice and bubbly and apples are soft. I usually cover my pie with tinfoil when I turn it down, and then remove it in the last 10 minutes of cooking and closely monitor the browning. For intricate pies, sometimes one part will brown faster, and I'll just place a small piece of tinfoil over that part. Best served on the first day with a scoop of ice cream on top.